Holiday magic is happening at the resort recently awarded United States’ Best Ski Resort by the 2014 World Ski Awards. Deer Valley Resort’s holiday events have become beloved annual traditions for visiting guests, the entire Park City community and locals alike. 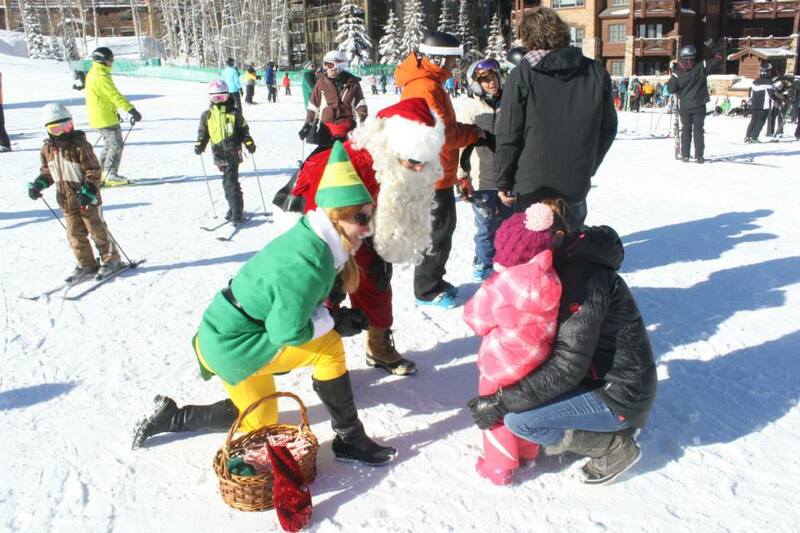 To celebrate Christmas, Santa Claus will visit Deer Valley on Wednesday, December 24, 2014. The jolly old man will first jingle around the Snow Park Lodge area at the resort base from 9 to 11 a.m., and then from noon to 1:30 p.m. in the Silver Lake Lodge (mid-mountain) area. Guests are invited to bring a camera and have their picture taken with St. Nick during his visit. 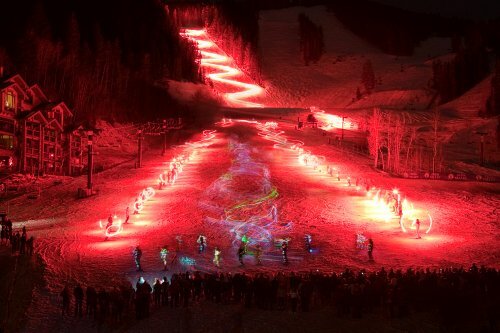 Another highlight of Deer Valley’s holiday season is the annual Torchlight Parade. The parade takes place Tuesday, December 30, 2014, at dusk (approximately 6 p.m.). The resort’s renowned ski school will dazzle guests with torches, synchronized skiing and incredible “illuminating” moves. The parade descends down Big Stick ski run on Bald Eagle Mountain and is best viewed from the plaza area of Snow Park Lodge, where complimentary hot cider and cookies will be served from 5:45- 6 p.m. New this year, the Snow Park Restaurant will remain open during the event and offer a full menu. Deer Valley Resort has guests covered when it comes to gift ideas for everyone on the list, which can be conveniently purchased at resort retail stores or ordered online. From the youngest to the oldest on the list, guests will find merchandise for any age and style at Deer Valley Signatures, Deer Valley Etc., Shades of Deer Valley, and NextGen DV offering skiing apparel and accessories for the next generation of Deer Valley skiers: toddlers to teens. For those who savor Deer Valley’s award-winning cuisine, perfect gift ideas include food items, such as the resort’s famed Turkey Chili Mix, Jumbo Cookie mix or housemade mustards and marinades. The top-selling resort cookbook Chocolate Snowball: and Other Fabulous Pastries From Deer Valley Bakery (now in its second printing in paperback) is a must-have for the bakers on the list. Also available are gift items such as fleece vests, stylish Deer Valley coffee mugs, plush toys, ornaments, jewelry, wine glasses and top quality sunglasses, goggles, clothing and accessories. Guests may shop at Signatures in person at three locations: 625 Main Street, Park City (open daily 10 a.m. to 9 p.m. year-round); Deer Valley’s Silver Lake Village (open daily 8 a.m. to 5:30 p.m. during ski season); and Deer Valley’s Snow Park Lodge (open daily 8:30 a.m. to 5:30 p.m. during ski season). Signatures items can be ordered online at deervalley.com or via phone at (800) 833-2002. Deer Valley Etc., Shades of Deer Valley and NextGen DV are all open daily during ski season in Snow Park Lodge. The Deer Valley Gift Card is also a fabulous and flexible holiday gift idea. The Gift Card can be used at any of Deer Valley’s operations for lift tickets, Ski School, restaurants, Signatures Stores, Shades of Deer Valley, NextGen DV, child care or ski rentals. Cards can be purchased for any amount, and are reduced by the amount of each purchase until all money has been used. Cards may be used while at Deer Valley Resort, or for phone orders for Signatures merchandise. Gift cards can be purchased online at deervalley.com or in person at Deer Valley Signatures. As the holiday season is all about entertaining, Deer Valley has 12 restaurants open during the holidays with options perfect for either an intimate dining experience or large-group fun. See the resort website for full descriptions of cuisine and restaurant hours. Happy Holidays from Deer Valley Resort! For more information or a complete schedule of holiday events and festivities, please log on to deervalley.com.